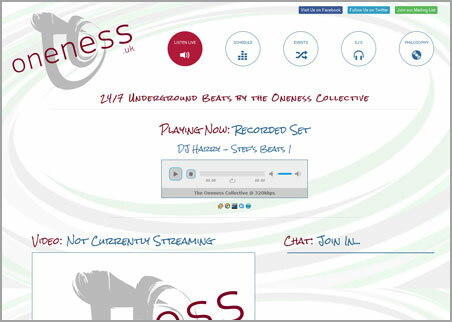 oneness.uk deliver underground music to their young, device and internet savvy audience. The web site delivers both high quality audio and video streams as well as a Chat Board for visitors to communicate amongst themselves as well as with the live DJ. The web site automatically updates itself when a DJ signs in for a live show and posts messages to the station's Twitter and Facebook followers that a live show is starting. It features a DJ registration and profile maintenance on the backend using which the DJ's can pay subs via the integrated PayPal account.